Day 1 of Book Blogger Appreciation Week: Appreciate! It's Book Blogger Appreciation Week! This is my first time participating in this event, I've been looking forward to it for weeks. I'm always on the hunt for more book blogs to fall in love with. On Day 1, today, we're to share with our readers some of the blogs we enjoy. 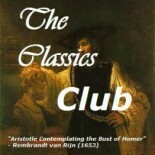 The Classics Club was started on March 7 , 2012 by Jillian at A Room of One’s Own. Her goal was to, “unite those of us who like to blog about classic literature, as well as to inspire people to make the classics an integral part of life.” She thought about several ideas but finally settled on inviting people to make out a list of (at least 50) classic titles they intend to read and blog about within the next five years. After a few months, the club grew, and it was decided to create a separate site to house everything related to The Classics Club. And this blog was born! FYI: Jillian's blog A Room of One's Own is one of my favorites, and through The Classics Club blog you can find many many other awesome folks that love to read the classics! It is good to find some great blogs via BBAW! I am going to check out a few of those! Here is my BBAW: Appreciation post. I have found so many great blogs because of BBAW, my eyes almost hurt ;) Thanks for stopping in Gautami! What a fantastic list of blogs, thank you so much for sharing with us! Absolutely Amy and thank you for heading up BBAW. This is my first time participating and I'm looooving it! I come via Wendy from Musings of a Bookish Kitty and I'm to have discovered your place here as it looks as though we have similar tastes in books. Although Gone with the Wind was a beating for me. ;) I just recently joined The Classics Club and love Jillian. Happy BBAW! I was exploring your blog yesterday Trish and I'm with you, we have a lot in common :) Enjoy BBAW, it is the MOST fun! Jill and That's What She Read are favorites of mine, too! Thanks for visiting my blog today, and it's great to discover your blog, and also the others that you've listed here, thanks for highlighting them. Right back at ya Lindsay! Gol, I love you Jennifer. Thanks for sharing! I can't wait to check some more out! Maybe my blog will eventually make the list! I love what a wide variety of blogs I am seeing on people's lists! Isn't this just about the most fun ever? It's my first BBAW and I feel like a kid in a candy shop! Speaking of classic literature, I am reading Edith Wharton's The House of Mirth. Thanks for introducing me to the Classics Club! Thanks for visiting me today! I love meeting like minds. =O) I am now following you back via GFC and email. Of course, you know I love Jillian's blog because I already posted about it (and The Classics Club). And Michelle at That's What She Read...I've followed her almost from the beginning. Gotta love another Michelle, right? Same spelling and everything! Insatiable Book Sluts...I was planning to follow because they (well, at least one of them) is participating in my EPIC Dark Tower series read-a-long. I will have to check out the rest of your list. Happy BBAW! Ha ha, I know what you mean about the name thing. Whenever I run into another Jennifer blogger I get all excited ;) Thanks for following me Michelle, I really appreciate it. I'm excited to read more reviews and news from you. Yay for HISTORY! Thank you so much, Jennifer! I am so honored to be among such great company! Stalk away, my dear! I love having you there. Your comments always, always make me smile! Great Rachel! I hope you enjoy it :) I love reading the classics but this is a great way to remind ourselves to do so, and to talk to others who are doing the same. Thanks, fellow word nerd, for sharing a great list of blogs! Can't wait to explore! Cute! I haven't heard of some of these blogs but I will be sure to check them out. I love BookBelle's blog as well!